Hearty, Happy Diwali Greetings! May this Diwali brighten up your life, may it lighten your burden and may it enlighten your path! Swami Saradaprabhanandaji, officials from Headquarters and all devotees here join me in wishing you all a wonderful Diwali ! Our world today is at the crossroads. While charity to help the poor and needy is increasing, it is disconcerting to see the rise of violence – domestic or national, crime, obscenity, corruption and other expressions of ill-gotten wealth. Serious people devoted to God and godly means of living are indeed worrying about the future prospects of their children. Is there, among the gloomy cloudiness, any shiny ray of hope? It is in this context that the various celebrations that have come to us from time immemorial from the spiritual land of Bharat hold the clue. One of the most loved celebration of all the Hindus the world over, is the Festival of Lights – Diwali, also called Deepavali. This ‘Five-day Festival’, as I explained in my last year Diwali post, traces the spiritual expansion of human growth culminating in the gaining of knowledge of God. Diwali signifies lighting of lamps in every household on the Amavasya night that follows the bright fortnight after Vijaya Dashami. No doubt this occasion marks joy and merriment. On the Diwali Day, rows of lamps decorate the houses and presents are exchanged. Diwali, in the north of India, is associated with the coronation of Lord Sri Rama when he returned to Ayodhya (in Uttar Pradesh) after vanquishing the demon King of Ceylon, Ravana on the day of Dasshera. Sri Ram had been in exile for fourteen years and the people were pleased to see his return to Ayodhya. 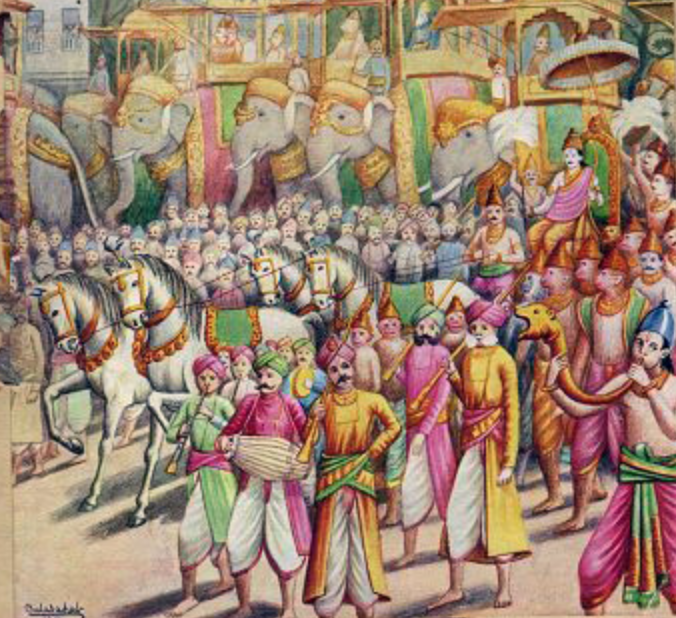 We get a graphic description of how the people of Ayodhya welcomed Sri Rama, Mother Sita and others in Sri Ramacharitamanasa written by the great saint Tulasidas. He says that “when the information reached the citizens, men and women all ran out in their joy (to meet their Lord). With gold plates containing curds, Durva grass, the sacred yellow pigment known by the name of Gorocana, fruits and flowers and young leaves of the sacred Tulasi (basil) plant, the root of all blessings, ladies sallied forth with the stately gait of an elephant, singing as they went. All ran out just as they happened to be and did not take children or old folk with them. People asked one another: “Brother, did you see the gracious Lord of the Raghus?” Having come to know of the Lord’s advent, the city of Ayodhya became a mine of all beauty. A delightful breeze breathed soft, cool and fragrant. The Sarayu rolled down crystal clear water. I was talking to Rivajh Singh, a young lad the other day about painting of themes from our scriptures. He is a student of Architecture and deeply interested in paintings. 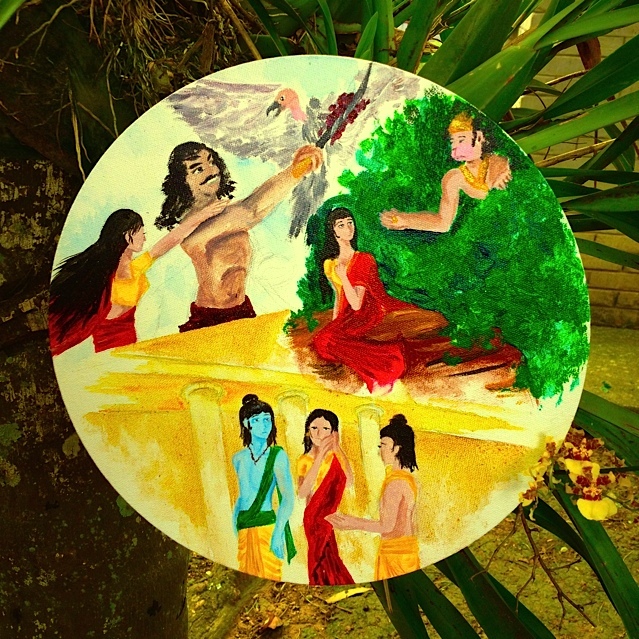 The above one was drawn by him with acrylics in a matter of a few hours depicting the theme of Diwali namely, Tyaga (sacrifice), Seva (service) and Prema (love). Can you identify which portion depicts which theme? And thanks Rivajh for your lovely gift on Diwali day! Again continuing to explain the warmth of reception accorded to Sri Rama, saint Tulasidas says that “the citizens were transported with joy at the sight of the Lord. All the woes begotten of their separation from the Lord now ended. “Seeing all the people impatient in their love to meet the Lord, the All-merciful Slayer of Khara wrought a miracle. He forthwith appeared in countless forms and in this way the gracious Lord met everybody in an appropriate manner. Saint Tulasidas just wonders how the mystery of Sri Rama in taking many forms and meeting each citizen could not be comprehended by anyone! Here in the words of Sri Ramakrishna, God became the ‘needle’ and the bhakta, the ‘magnet’. 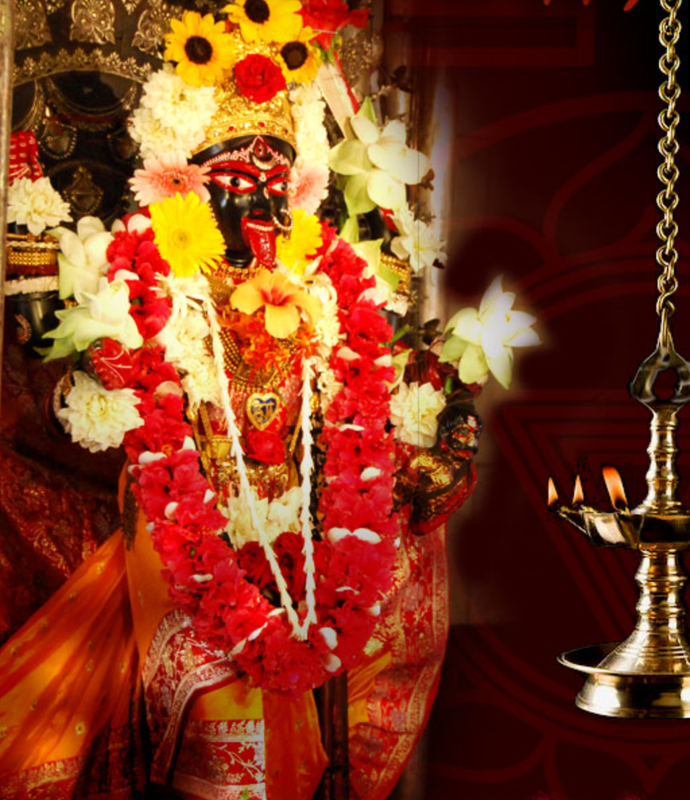 Diwali is also indeed associated with the worship of Divine Mother in the form of Kali. The famous Sanskrit hymn Sri Durga Saptashati called Sri Sri Chandi in short gave Kali worship a new meaning. When the Devi Chandika battles with different demons, there emanates from Her forehead the awesome and ferocious Kali. As Her origin is associated with the third eye, called ajna chakra in the yogic parlance, She represents the intellectual and intuitive faculties. Kali seeks out and destroys the little lower self (which is ruled by rajas and tamas) so that it will obtain progressively higher levels of knowledge. This chakra denotes the silence of a soundless state when the true knowledge dawns. This festival gives us, Hindus, an opportunity to go beyond the external extravaganza. It offers an opportunity to dive deep into one’s heart and search for all types of demoniac qualities residing inside. Thus, the need is felt to clear the darkness from the heart. To drive away the darkness we have to light the lamp thus let the Light of knowledge in. Sri Krishna encountered the demon Narakasura, who before his death entreated the Lord to celebrate with lighting of diya and burning firecrackers. We all do the latter part but do not pay attention in removing the darkness. As Swami Vivekananda says, darkness in a sealed room over one thousand years will instantly vanish the moment a matchstick is lighted. Knowledge of God is light. When a lamp is lit on Diwali, just pray to your chosen ideal that the darkness of ignorance be removed from your heart. Hence, while celebrating Diwali, let us pray to the Divinity (in whatever form one may believe in) to bestow the right knowledge by which we can lead a peaceful and prosperous life with service to the poor and needy. It is my fervent prayer that each one of us be blessed with such noble and divine qualities! May the light of the lamp burn brightly in our hearts on this holy occasion of Diwali ! Next Post: Jai Jagaddhatri ! pranam on the occasion of Deepavali and Kalipuja! I have heard much from your daughter in Botswana about the holy legacy that you are carrying. So many anecdotes about the senior monks who lived a pure life and set down in the name of our Master! Yes, happy Deepavali to you all! Pranam and our Diwali Greetings to Maharaj! A happy belated Deepavali greetings to you! I convey the greetings of my family. Happy Diwali…hope that you had a wonderful celebration. Pray that the eternal light always shines bright and dispells all negativity and darkness in our hearts, mind and life. Jai sri Raam! Yes, I had also wonderful Diwali here. A few devotees had assembled at about 6 pm and we all lit 108 lamps in the shrine and other surrounding spots. The first lighting was done by me in front of Master at the altar and all other lamps were then lit. Earlier from 4 to 5 pm we had a short Satsang when Jessica spoke on the significance of Diwali. I added the description of Sri Tulasidas about the people’s reaction to the triumphant return of Sri Ram with Sita maiya, Lakshman and others. No fire-crackers! Later I left for PMB where in Omilla’s home I witnessed a number of fireworks to our great delight. That a great occasion this Deepavali to every one in this planet is significant with ideas of tyaga, seva and prema! Kudos to the little lad who depicted them so nicely! Let all our children imbibe the noble messages of our great epics! Thank you for appreciating the beautiful acrylic painting done by Rivajh! He showed me sometime back a few of his creations and I was deeply impressed with his talent. I heard that the Principal of his school, kept in his office room for a long time one of his creations! This painting was done in such a short time! Ram Ram and thank you Maharaj.